Shivala Ghat, Benares (U.P. ), with the Daniells' budgerow and a morpunkhi on the river. 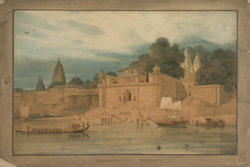 Original sketch taken 17 or 22 November 1789.
bl.uk > Online Gallery Home	> Online exhibitions	> Asia, Pacific and Africa Collections	> Shivala Ghat, Benares (U.P. ), with the Daniells' budgerow and a morpunkhi on the river. Original sketch taken 17 or 22 November 1789. Shivala Ghat also known as Kali Ghat is privately owned by the ex-ruler of Varanasi. Shivala, the fortress of Chet Singh, a representative of the Nawab of Oudh, stands behind the ghat. The fort (the old palace of the Maharajas) is where the British imprisoned Chet Singh in 1781 but he escaped by climbing down to the river from a small window on the north wall aided by his followers who fashioned a rope out of their turbans.